NordVPN is a very popular VPN provider who claims to be The World’s Most Advanced VPN. In this review, we’ll put them towards multiple tests to see if they are as good as advertised. 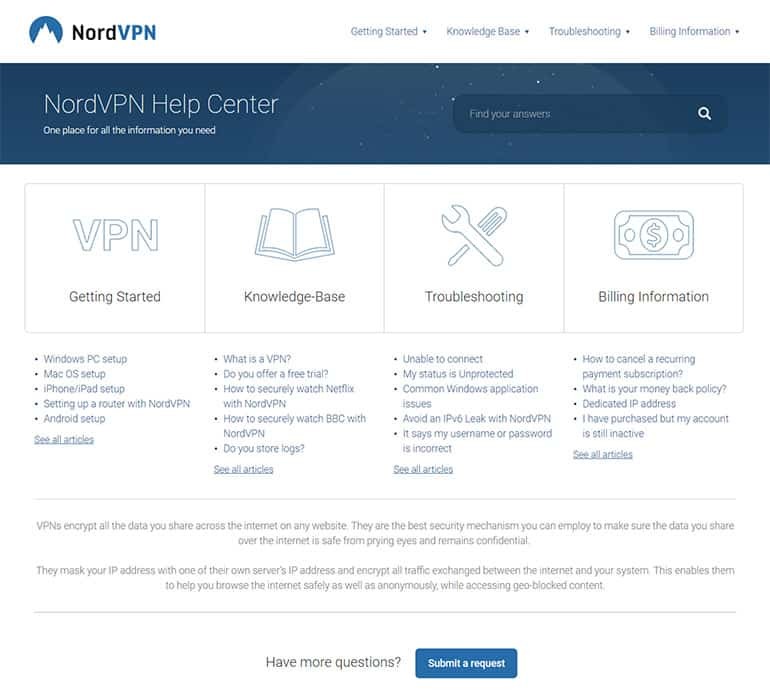 What is NordVPN and What Does it Do? According to their website (www.NordVPN.com), NordVPN was launched 2008 in Panama and is operated by Tefincom co S.A. The fact that their company is located in Panama can raise some red flags on how they might run their business, but that’s not true. All good VPN providers are located in independent countries that don’t share information on logging (Switzerland, Singapore, Caymans, BVI and so on). However, I decided to dig a little deeper to find more information about their company. NordVPN definitely hides this information well enough. I wonder why. I’ll say it – nobody cares what you do and who you are as long as you deliver an excellent service and don’t keep logs, right? Funny thing: When I actually paid for the test account to write this NordVPN review, my payment went to CloudVPN Inc. – which is located in the U.S. (five eyes jurisdiction is bad for VPNs). When I asked NordVPN about this intransparency, they simply told me that they just handle payments through CloudVPN Inc. and it’s not associated with their VPN application/company. To believe or not to believe? Hard to say. Non-Technical: NordVPN have gone all out on security and have employed above industry standard encryption algorithms. If you opt to turn this feature on, NordVPNs double encryption will relay your data via not one, but two subsequent VPN servers, before it reaches the web page or application you’re attempting to access. By chaining your connection through two VPN servers, your data gets encrypted twice. In addition to the (often unnecessary) double encryption, the second VPN server will be unaware of your original IP address and connections are always made via both UDP and TCP protocols. This is a “one extra step” security feature. The vast majority of you are unlikely to ever require it, especially if you’re use is limited to simple P2P and Netflix unblocking. Not to mention the impracticality of the drastically reduced speeds you’re going to incur. The main feature of CyberSec remains the website blocking feature which automatically scans websites you’re about to visit against popular blacklists and protects you from getting involved in phishing scams and other cyber threats. In case your device is already infected and being used in a botnet, CyberSec will block your participation by detecting and cutting any forced involuntary communications. And of course, the ad-blocker. It will not only block your regular ads, but will also hide unwanted pop-ups and autoplay videos ads. This is especially useful and recommended if you’re using mobile data as ads love to use up unnecessary bandwidth. NordVPN currently claims to have 1100+ servers in 63 countries. That’s a LOT. Some paid VPNs only have 20-30 countries and 50 servers. However, two bigger (and probably better) VPNs like ExpressVPN and PIA have both more than 1,500+ servers. Technical: You have a full choice of OpenVPN, IKEv2/IPsec, L2TP/IPsec, PPTP and SSTP. Windows clients come with OpenVPN, while iOS & Mac default to IKEv2/IPsec. Not only do they have applications for Windows, Mac, iOS, Android they have detailed tutorials for protocol connectivity for them and 40 other mobile OS, RaspberryPi’s and routers. Kill Switch NordVPN software automatically kills your connection if your VPN connectivity is interrupted, blocking your device or terminating certain programs from accessing the internet. DNS Leak Protection If you have set up your VPN connection manually (say you didn’t want to connect via OpenVPN) or have recently reset your Windows, you’re prone to DNS leaks. These DNS requests will then be completely unprotected. NordVPN have implemented measures to protect you and negate such leaks. Onion Over VPN For extra protection, or those desiring to visit the dark web (TOR network), NordVPN offers you the ability to route your traffic first through their VPN and then send it to the Onion router. SmartPlay SmartPlay technology ensures you can access more than 400 geo-restricted streaming services; Netflix, Amazon Prime, Pandora, BBC and others. With more and more VPN servers unable to access Netflix, this is a welcome feature. NordVPN can be contact by support@nordvpn.com or through live chat. Even after reviewing over three dozen different VPN providers, hundreds hours of testing, examining and reviewing, we still have questions or need for technical assistance. No different to the best of the best, NordVPN has recently began offering 24/7 live chat that will assist you with any question you may have. I used their live chat twice, for an encryption question and an open ended question. Yes, 500 articles. The directory is so big that I estimate the majority of live chats are simple redirection to one or another article – exactly how it should be. Very impressive, NordVPN, very impressive! To gauge just how efficient NordVPN is at securing your traffic, I conducted several dozen speedtests from our offices in Europe, connected to the US, UK, EU and Asian servers. Some of them have been awful (hint: Avira Phantom). For this speed test, I used 100 Mbps Cable Internet connection. And while the best VPNs managed to achieve download speeds of 70 Mbps+ and up, NordVPN only came out with 14.33 Mbps. I tried this multiple times, but the figure I saw on speedtest.net didn’t change much. About average, pretty good for a six thousand mile journey. Very low speeds for the EU unfortunately. I made sure to repeat tests several times, over the course of 5 months, only to end up with the same results. From 100 Mbps down to 8? An absolute disaster; no sugar-coating here. It’s odd to see US speeds multiple times faster than EU speeds (since I’m located in Europe), servers which are only a few hundred miles from our physical location. And as much as I hate to say this, a lot of NordVPN slows down your connection speeds. That’s just unfortunate. All those subscriptions come with one-size-fits-all plan. To make this NordVPN review accurate, we signed up for their one month plan. Personally, I am all in favor of simplicity and fairness when it comes to pricing. Give me one plan all-inclusive plan and a few payment options and I’m happy. Whichever subscription you chose, you get everything they offer: all major features, including access to all their servers, six simultaneous connections, full high-speed unlimited bandwidth, access to their DoubleVPN servers which encrypts data twice, their Tor over network servers, and protected Bitcoin use too. Having said all that, their yearly plan’s pricing is very competitive. While I would never recommend you to sign up for a month-to-month plan with them, I have to admit, their yearly plan is value central. Start by logging into your account on NordVPN’s homepage to bring up yourProfile page. This first page is your account information, including payment options and a way to download the client. Let’s head over to the Download Area now to select the first VPN client for your device. Download Area has a list of all the operating systems that NordVPN will work on (in addition to their standard apps for each). They’ll automatically pick up on your device and recommend a few to start with. Select the appropriate one, like Windows 10 Application, and let’s start the install. You’re on your own for this part. Go through the typical installation process for your operating system. Let’s meet back up in a sec. Alright, now we’re ready. After going through the installation process, you can finally login to your new client. Use the very same username and password for your account and click Login now. This is the screen you are brought to after logging in. In order to switch servers click Servers at the top of the client window. To connect to a specific server, find the server location you want and clickConnect now or choose the client’s recommended server on the right-hand side and click Connect now. You can also see that NordVPN will recommend a few different server types above the independent locations if you’re looking for a specific objective instead. As stated on their homepage, NordVPN offers 30 days money back guarantee. If you wish to cancel their service and get refunded, here’s what you need to do. Once that’s done, write to their support (support@nordvpn.com) that you need a refund. If 30 days haven’t passed for your first sign up, you’ll be issued a full refund within 3 to 10 business days. P.S. Users who purchased NordVPN through Apple App Store or Google Play Store cannot be refunded. So here you have it, NordVPN review with cons, pros and speed test. Works with Netflix – at least for now.. Slow download speed – I truly hope this gets fixed ASAP so I can do a re-test. Company is not enough transparent – what’s the company name? Without the negatives such as their extremely oversold VPN servers that can barely function (read, very slow connections) they can be a good option. However, there are better alternative available. For the similar price ($5.75/mo), you can get a VyprVPN ($5/mo, that offers 3 day trial) as well asZenmate($4.99/mo). Find our top performing VPNs here. 2 Responses to "NordVPN Review - Cons & Pros of NordVPN (including speed test)"
NordVPN is good, But i did not used VPN better then Express, Checkout the complete and detailed review of ExpressVPN.